If you’re learning Spanish, you’ve probably heard of Madrigal’s Magic Key To Spanish. It’s our readers favorite Spanish learning book. We’ve seen 600+ purchases just from mentioning this book in an overview post. The week we arrived in Ecuador, someone loaned us their copy because they said it was the best book to get us started. It’s the book we used to learn proper pronunciation, and one we’ve continually referenced over the past 6 years. When asked for recommendations, it’s always at the top of the list. 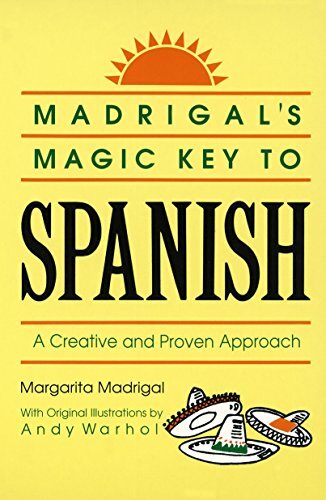 Although Margarita Madrigal wrote this book in the 1950’s, it’s still a “magic key” to learning the basics! So we thought it was time for a Madrigal’s Magic Key To Spanish review. Anyone can read, write, and speak Spanish in only a few short weeks with this unique and proven method, which completely eliminates rote memorization and boring drills. You may be wondering why this book is so popular. Why all the buzz about this book? The short answer is: it’s simple and logical. Margarita Madrigal shows you that (although you may not realize it) you already know thousands of Spanish words. Although they are pronounced differently, they are easily recognizable from their English equivalents. Some are even spelled exactly the same! She gives you a letter-by-letter (vowels and consonants) pronunciation key, and then lists all the Spanish words that are familiar to English speakers. And for the words with slight changes, she created a number of simple pronunciation keys which she encourages you to carry around for faster learning and communication. With these keys you will start to understand what people are saying and be able to translate English thoughts into Spanish expressions. There are 45 lessons in this 496 page book, and as you can see from the picture below, she jumps in with very usable material right from the start. So rather than constantly referring to a Spanish/English dictionary, you’ll have a few pronunciation keys which help you convert English into Spanish in an instant. Granted you may still want that dictionary handy, but you will not be tied to it nearly as much. Margarita also provides the words you’ll need to form sentences, and she makes you practice them by writing them down. You are also encouraged to follow through and translate provided sentences back and forth between Spanish to English and the reverse. By doing these exercises you learn to speak, read, write, and think in Spanish which is what you are promised in the preface of the book. The Madrigal’s Magic Key To Spanish review is an easy one to write because of how much I like this book. It’s been very helpful! I really like the way Margarita started out teaching verbs in the past and future tenses rather than in the present tense. Most conversations are based on what you did or are going to do, not what you are doing at that exact moment. She also teaches the most simple and common verb tenses, the ones used in everyday speech. And the sentences she teaches are in the context of conversations, much more useful than random bits of speech thrown in here and there. There is no use cramming your brain full of rarely used tenses when you are starting out. As you progress in the language you can move on to more complex tenses. Something kind of funny is that we refer to this book as the “Madrigal’s Miracles” book. Not sure how Madrigal’s Magic Key turned into that, but it did :). Don’t let this overwhelm you. If you are getting started – or struggling with your progress – I recommend you start with a copy of Madrigals and complement that with Pimsleurs audio. Do You Have A Copy Yet? If you’ve been having a hard time figuring out where to get started, I highly recommend buying a copy of Madrigal’s Magic Key To Spanish! And even if you are already on your way, this book will help you understand the language and progress with your speech. I really think that every English speaker learning Spanish should have a copy of this book, it’s that good. Many of our readers are using Rocket Spanish to learn Spanish online. Have you used this book to learn Spanish? Do you agree with this Madrigal’s Magic Key To Spanish review? Please share your comments here. You might find it used at the Carolina Bookstore. Otherwise, I’m not sure. There aren’t many options for new English books here. Hello Dana, After reading all the positive comments on this book, I placed my order on line. It’s available at Book Depository, an online book store, with free shipping world wide. Yes, yes, yes!!! Best book ever. We bought it before moving to Bogota to compliment our Spanish class we were enrolled in. It’s the only Spanish book I brought to Colombia…and I’m using it everyday! Love it, love it, love it! The oldest and most practical teaching method/book ever. Dena: do you know a place in Cuenca, Libri Mundi maybe, where one can buy this book (Madrigal’s) ? We’ve seen it used at the Carolina Bookstore. Or you can buy the Kindle version on Amazon. Hi Dena, I love Madrigal’s. It has been the single biggest help to me learning Spanish. Marcus Santamaria uses her approach with some great audio and video courses, too, and his courses are on the less expensive side. Just do a search for his name and mention Spanish.